Built from the ground up, MegaMouth™ eliminates all of the problems you’ve ever had with a bowfishing reel! No buttons to push. Durable gear system that lasts! Anti-reverse that won’t fail. No-restriction cone. High-torque. High-speed retrieve. Pins that won’t break. Easy-to-adjust drag. And more! “DRIVESHAFT” ANTI-REVERSE While the anti-reverse on other reels works via the reel gear, putting undue stress on what is already an over-taxed gear, MegaMouth runs its anti-reverse on the main shaft. This allows you to confidently pull arrows from the thickest muck or power crank big fish without worry. SMOOTH PERFORMANCE: EASY SPOOLING MegaMouth features nine ball bearings for ultrasmooth performance. A handy through-hole in the spool core makes installation of new line a cinch and prevents the line from slipping on the spool. 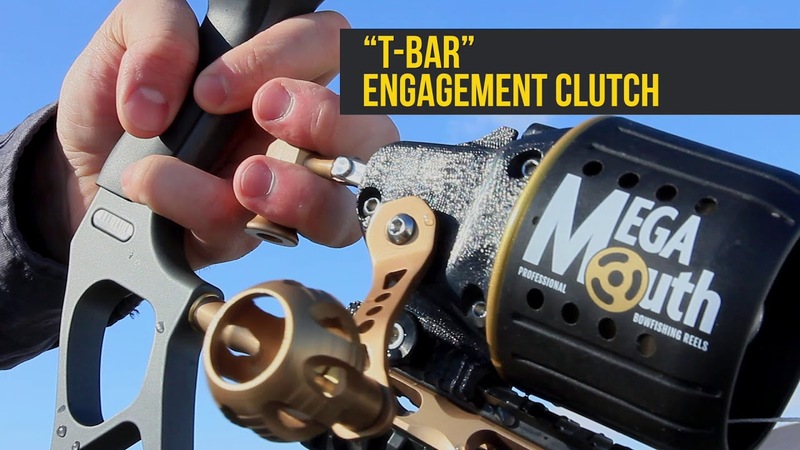 “T-BAR” CLUTCH–BOWHAND ENGAGEMENT Pull the T-Bar Clutch to engage the MegaMouth spool which allows you to retrieve your arrow or pull in a fish. T-Bar position is adjustable so it’s within easy grasp of your bow hand. “NO-FRY” DUAL STAINLESS STEEL GEARS Other spin cast reels employ single-molded or formed gears (designed for playing fish, not cranking in arrowed fish) that are prone to fail. MegaMouth features dual stainless steel and brass gears designed for bowfishing and hauling in big fish. “FIREFAST” RETRIEVE MegaMouth’s 4:1 gear ratio and extra long handle give you the fastest line retrieve per crank and unmatched torque in the industry, of 28” of line retrieve per crank. UNIVERSAL DESIGN MegaMouth can be easily converted to right or left hand. “QUICK-ADJUST” DRAG Instead of the common, difficult-to-adjust dial drag, MegaMouth employs a finite 180° Quick-Adjust drag system that’s far easier to adjust while fighting a fish. “FREEWHEEL™” DESIGN = BUTTONLESS FREE SPOOLING Unlike modified fishing spin cast reels (sold as bowfishing reels) that require pushing a button to release the line, MegaMouth is a bowfishing reel that defaults to FreeWheel™, free-spool shooting mode. Plus, the line spool is free to rotate in shooting mode. There are no buttons to push, no way to accidentally shoot an unreleased reel. Once you’ve shot, to retrieve simply pull the conveniently positioned T-Bar handle with your bow hand and crank the handle. “MEGATOUGH” AXIAL TRIPLE PIN SYSTEM The pins on traditional spin cast reels are radial (they move outward) which means they are subjected to considerable force, commonly leading to breakage. MegaMouth uses three axial pins which move forward and back offering far more strength and virtually eliminate the possibility of busted pins. Three pins also mean faster line engagement on retrieval. MEGAMOUTH ULTRA-WIDE REEL CONE Friction is the enemy. MegaMouth’s ultra-wide, flared reel cone dramatically reduces both friction and line-whip as the line exits the reel and shoot-through rod during the shot. This results in faster arrow flight. “HEX-SET” TORQUE ROD MegaMouth’s adjustable Hex-Shaped Torque rod can’t rotate like round rods can; a single-thumb screw lets you quickly disconnect the rod. LIGHTS UP THE NIGHT! Replaceable lights on the line deflector and handle really light up the night. “PIC RAIL” MOUNT MegaMouth’s picatinny rail mount gives you quick release detachment and allows easy forward/ backward position adjustment. This sturdy mount won’t loosen with use and can be used to easily mount lights and other accessories. MegaMouth is a bowfishing reel built strictly for bowfishing! MegaMouth is buttonless and free-spooling so it is ready to shoot at any time without having to push a button. Instead of pushing a button to release it before the shot, with MegaMouth, you pull a clever T-Bar handle after the shot to engage the retrieve. It makes absolutely no sense to have a release button on a bowfishing reel. MegaMouth is built tougher. Modified fishing spin casters rarely last very long. They’re simply not built to bowfish. They’re built to fight 3 pound bass hooked in the mouth, not 30 pound carp shot in the side. Their gears strip, pins break, and anti-reverse fails. MegaMouth is built to bowfish. Dual stainless steel and brass gears (versus single molded or formed gears), three heavy-duty axial (not radial) pins and an anti-reverse system designed for big fish means your MegaMouth will last for many years not just a few weeks. MegaMouth retrieves sooner. With other spin cast reels you must reach with your non-bow hand for the reel handle and turn it to engage. By then, the fish has peeled off several extra feet of line which must be retrieved. With MegaMouth, you immediately engage the reel with your bow hand by grasping the T-Bar which allows far less line to get out and saves you valuable time. MegaMouth retrieves faster. MegaMouth is all about performance. When you shoot MegaMouth, the wide open reel mouth means far less friction. Then, when it’s time to pull in a fish or your arrow, MegaMouth’s 4:1 gear ratio cranks in an unmatched 28 inches of line per revolution of the extra-long handle. There is no faster retrieving reel! MegaMouth also lights up the night! Four internal lights can easily be turned on creating a cool effect for night bowfishing. Made in the USA! MegaMouth is 100% made in the United States. If, after bowfishing with your MegaMouth™ FreeWheel™ Reel for 30 days, it is not the best spin cast-style bowfishing reel you’ve ever used. We will buy it back. No questions asked, guaranteed! All components in a MegaMouth bowfishing reel are manufactured in the USA and it's assembled here, too.